1. 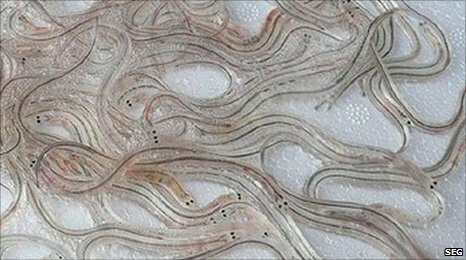 GLASS EELS - This rare cuisine comes from French and Spanish waters. These delicacies are only saved for rare occasions. 2. BLACK TRUFFLES - There are many types of black truffles, however, there is only one real one - the Tuber Melano spore. It is a fungi also called the Black Perigord Truffle because most have been found in the Perigord Region of France. As of December 2009, they were sold for about €3,940 per kilo in a retail shop. 3. WHITE TRUFFLES - These types of truffles are found in the area of Piedmont in northern Italy and around the city of Alba. Like the French truffles, Italian truffles too are very sought after and also grow symbiotically with oak trees. As of December 2009, they were being sold at €10,200 per kilo. Macau casino owner Stanley Ho paid US$330,000 for a white truffle specimen weighing 1.5 kilos. 4. KING CRAB - the Alaskan Red King Crab, particularly, with its massive pincers and enormous body is another sought-after delicacy. 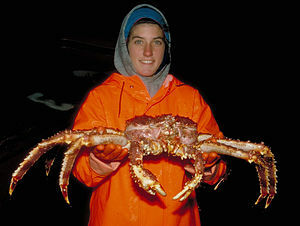 Fishing for these crabs is highly dangerous and carried out during the winter months along the coast of Alaska. 5. BELUGA CAVIAR - is the most expensive type of caviar, with present market prices ranging from $7,000 to $10,000 per kilogram. 6. FUGU - is a Japanese dish prepared from pufferfish. It can be lethaly poisonous due to its tetrodotoxin and therefore has to be carefully prepared to remove toxic parts to avoid contaminating the meat. Restaurants that prepare fugu is strictly controlled by the law in Japan and several other countries. It is currently one of the most notorious dishes in Japanese cuisine. 7. ABALONE - considered a maritime treat and a delicacy in most parts of the globe. Its shell is also used for making jewelry. 8. 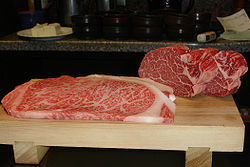 KOBE BEEF - cuts of beef from the black Tajima-ushi breed of Wagyu cattle, raised according to strict tradition in Hyogo Prefecture, Japan. This meat is renowned for its flavor, tenderness and well-marbled texture. Often prepared as steak, sukiyaki, sashimi and more. 9. BLUE LOBSTER - these blue lobsters are found in icey waters off the cost of England to Morocco. The meat is tastier and juicier compared to that of a normal lobster. It turns red when cooked. 10. YUBARI MELONS - This watermelon is sold for a big sum in Sapporo City, Japan. Yubari Melons are famous for its sweet and high quality. The most expensive fetched a price of US$22,872.